Ecclesiastes 1:9 (NIV) – “What has been will be again, what has been done will be done again; there is nothing new under the sun.” This year, Donald Lawrence is taking us back to Goshen in the Book of Exodus—and reminding us why the story is just as relevant today. Goshen (RCA Inspiration) will reunite GRAMMY® Award-winning singer-songwriter-producer Donald Lawrence with the original Tri-City Singers. The album will also mark the 25th anniversary of A Songwriter’s Point of View, the 1993 debut recording by Lawrence and the Carolina-based Tri-City Singers. Genesis 45:10 (NIV) (God speaking to Israel) – “You shall live in the region of Goshen and be near me – you, your children and grandchildren, your flocks and herds, and all you have.” Located in Egypt, Goshen was the place given to the Hebrews by one Pharaoh, but another Pharaoh arose, and felt they were becoming too powerful so he enslaved them. This land was blessed by God, it is stated God’s presence resonated high there. But for Lawrence, Goshen is more than a physical location—it’s a city set apart (Exodus 8:22-23). It’s a concept Donald Lawrence has been mulling over since gospel songwriter-producer Jermaine Dabney brought him an early version of the song “Goshen” about three years ago. The GRAMMY® Award-winning Lawrence has put his inimitable stamp on contemporary gospel music as a choir director, solo artist, songwriter, arranger, and producer. Whether for his own projects or for Kirk Franklin, Donnie McClurkin, The Clark Sisters, or Karen Clark Sheard, Lawrence weaves texturally-rich choral patterns that reflect his music conservatory training, his skills forged in the crucible of church music, and his abiding affection for musical theater. “He Heard My Cry” also showcases talented Chicago-based hip-hop artist Sir the Baptist (who also co-wrote and co-produced the song). Lawrence met Sir eight or nine years ago while teaching music business at Columbia College Chicago. A huge Tri-City Singers fan since childhood, Sir is one of Goshen’s several collaborators. Sir also serves as a Co-Producer of the album. New Orleans hip-hop combo Tank and the Bangas, who won the 2017 NPR Tiny Desk Contest, is another collaborator. The group appears on “Let My People Go,” a song that uses Moses’ declaration to Pharaoh to speak out against today’s social injustices. “The Sound of My Breathing (YHWH)” takes its concept from when Moses was at the burning bush, when he asked God His name and he heard the sound of the wind (Exodus 3:13-14). For Lawrence, pronouncing the Hebrew name for God transcribed into English lettering, YHWH, is like breathing YH (inhale) WH (exhale). But in the end, it’s all about the story. To mark the 25th anniversary of his debut album with the Tri-City Singers, Lawrence has gathered nearly all of the original choir members to participate on Goshen. One of the new members is the daughter of Robin Rowe-Stewart, a Tri-City singer who Lawrence first met when they were in first grade, but who passed away from breast cancer in 2002. “Her daughter is a singer and sounds so much like Robin, it’s unbelievable!” he says. It’s been a busy time for Lawrence as he’s toggled between working on Goshen, performing, and serving as vocal score arranger for Born for This: The BeBe Winans Story. The new musical, which tells the story of BeBe & CeCe Winans through BeBe’s eyes, has played Atlanta, Washington DC, Los Angeles, and Boston. Opening a show on Broadway has always been his dream, and Born For This is Broadway-bound. Right now, releasing Goshen is at the top of Donald Lawrence’s mind. Could the album be a trendsetter, just as A Songwriter’s Point of View was a quarter-century ago? 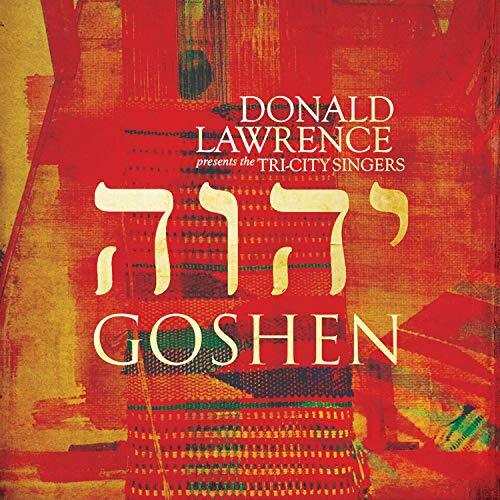 The post Donald Lawrence & The Tri-City Singers: GOSHEN. Album Out Now! | @DonaldLawrence appeared first on BlackGospel.com.